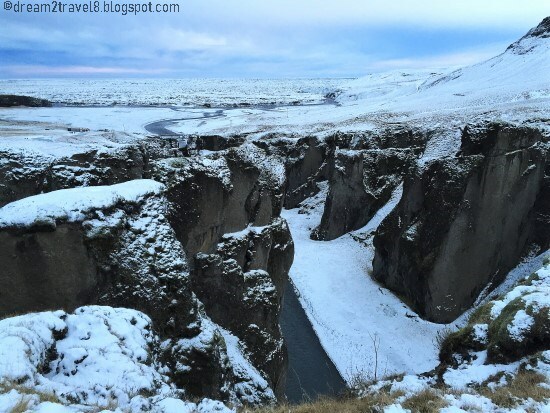 It was another itinerary-packed day travelling through the Golden Circle of Southern Iceland! Filled with excitement for the day, every one in our tour group had woken up way earlier than the scheduled time. My husband and I were surprised to see that we were one of the last few to gather at the breakfast corner, with the rest already happily helping themselves to the breakfast buffet spread! 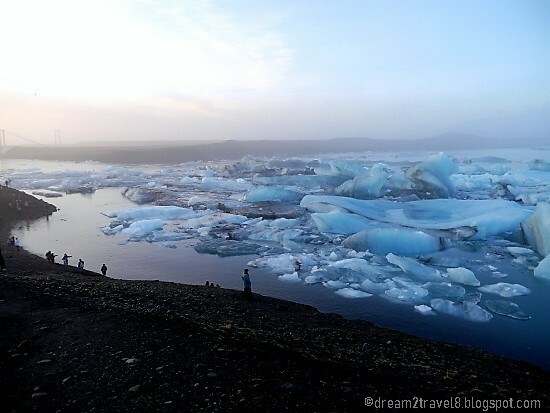 After filling our tummies, we eagerly boarded the van and zoom off to the first destination of the day - Jökulsárlón (or glacial river lagoon). 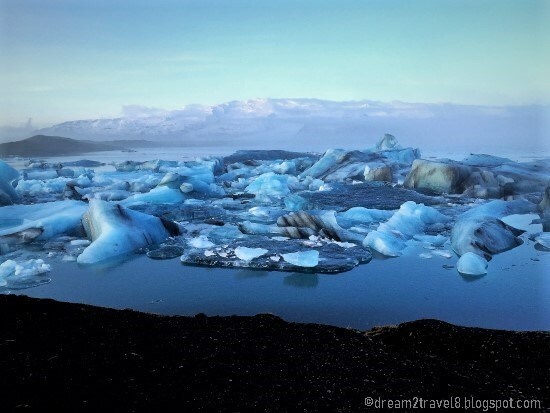 This glacial lagoon is right next to Vatnajökull, Europe's largest glacier and it is formed naturally from the melted glacial water. 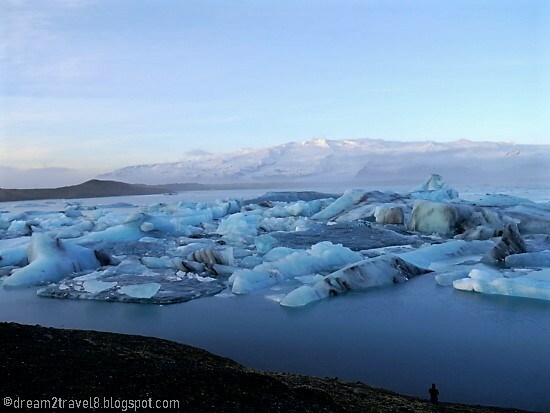 The chunks of icebergs floating on the still and blue waters are from the surrounding Breiðamerkurjökull Glacier, part of larger Vatnajökull Glacier. 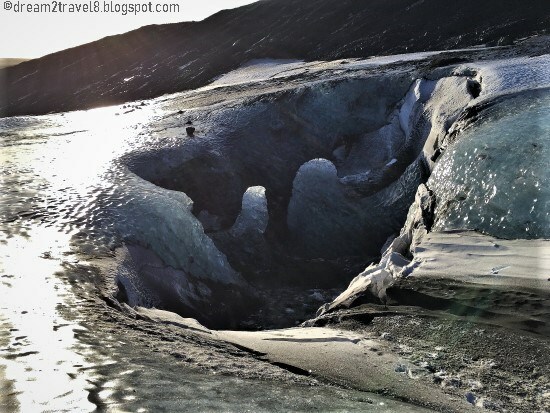 The lagoon is getting bigger each year, with more and more blocks of iceberg crumbling from the ever decreasing glacier into the lagoon. 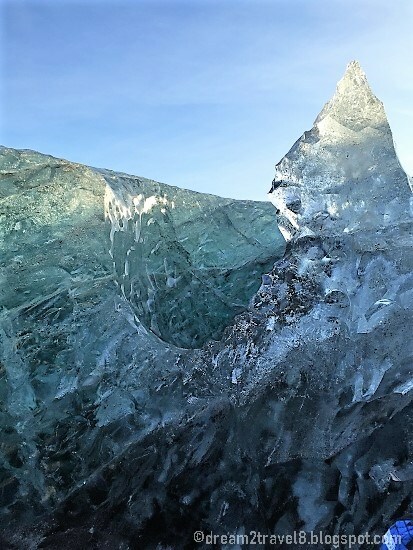 Most of the icebergs are milky white, with some appearing blue as a result of the interplay between the light and the ice crystals. 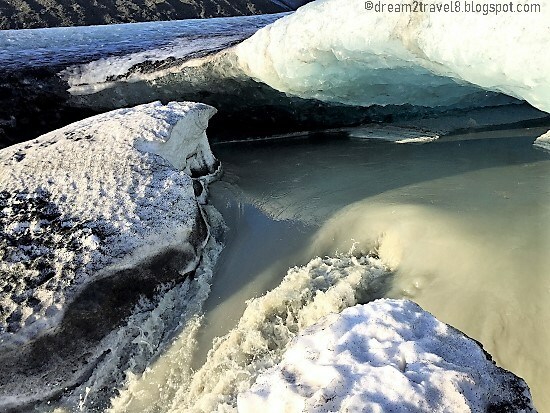 The stillness of the water coupled with the huge chunks of bluish white icebergs resulted in a phenomenal sight, one that made me wonder if I was still on planet Earth. 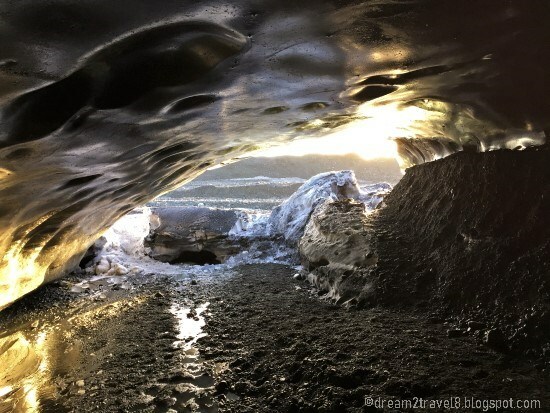 This unusual sight is also the reason for it to be a popular filming spot! With the winter sun barely risen from the horizon, the whole place was dominated by the “blue-ness” of the water and it evoked an eerily calm aura! It certainly felt surreal to be there! 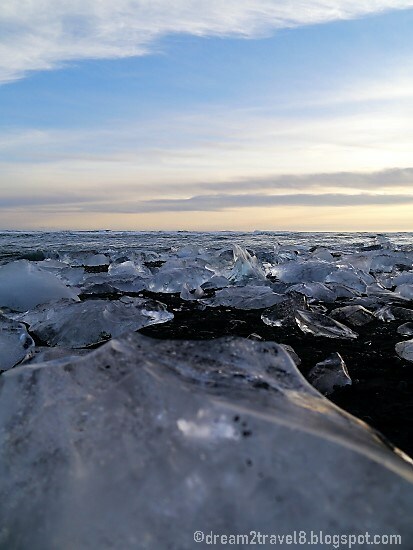 Our second destination was a short drive from Jökulsárlón - the Diamond beach. 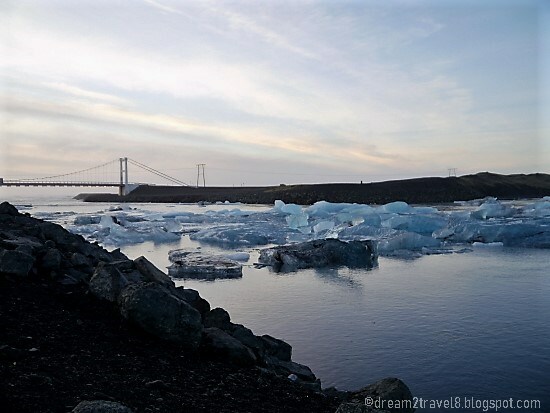 The smaller chunks of iceberg from Jökulsárlón are constantly being carried away by the water currents and would float under the bridge on ring-road 1 into the Atlantic ocean. The Atlantic waves would then crash them back onto the black volcanic beach, hence forming the Diamond beach. 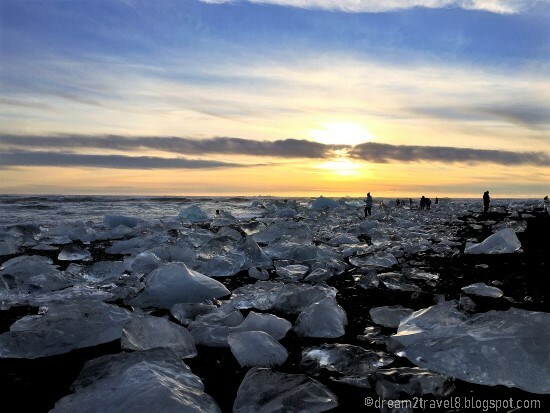 Melted and shaped by the Atlantic water and waves, the ice crystals on the Diamond beach looked like smaller and polished versions of the icebergs seen in Jökulsárlón. 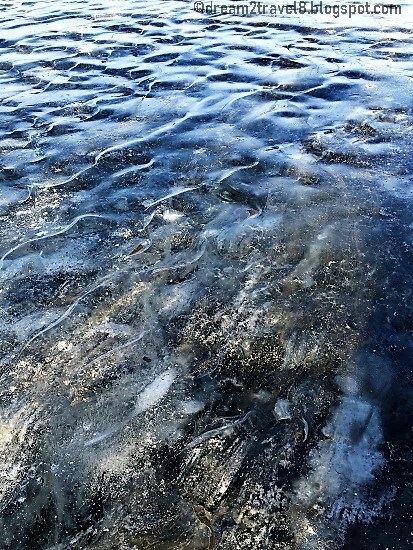 The ice crystals located all over the black volcanic beach really looked like diamonds created by Mother Nature and it was absolutely a scene that I will never forget! 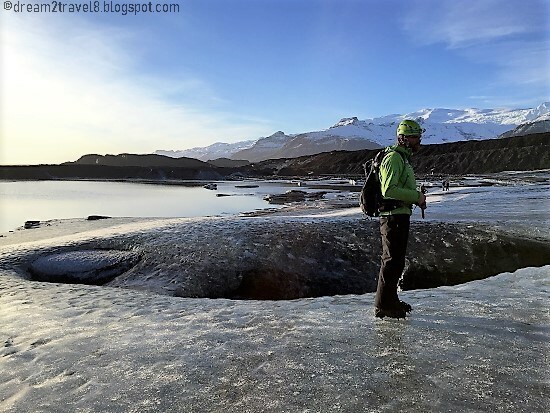 After spending some time posing with and taking tons of photos of the “diamonds”, we were ready to set off to our next destination - Vatnajökull glacier (for our ice cave tour). 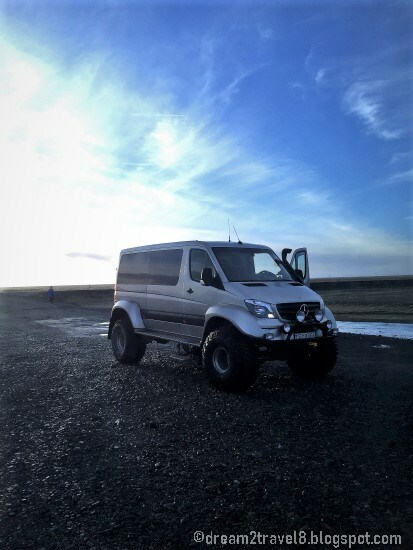 We drove into Vatnajökull National Park in our van before switching over to a 4*4 jeep which brought us to the foot of the glacier after a crazily bumpy ride. There, we had to put on our crampons and helmet and hike a distance on the glacier........................................................................................only to realize that we cannot enter the ice caves as they were all melting and had tons of water gushing out of them. What a disappointment!! Well, the only consolation was that we got to do a second glacier hike and see many interesting ice formation along the way! At the foot of the glacier..
Hungry and disappointed at not being able to enter the ice caves, we made a pit stop for lunch at a small cafe. Did I mention that food is very expensive in Iceland? 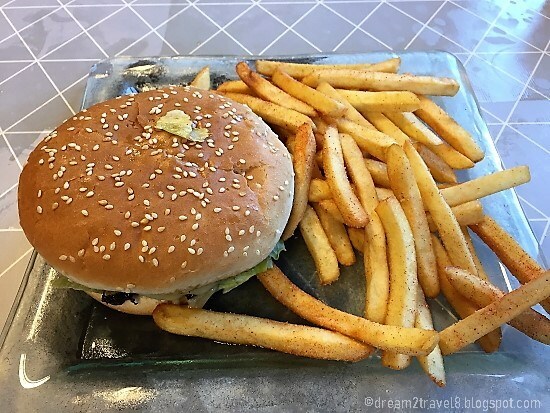 Yup, there, my husband and I had the most expensive burger to date and it most certainly did not help in uplifting our already downcast spirits! 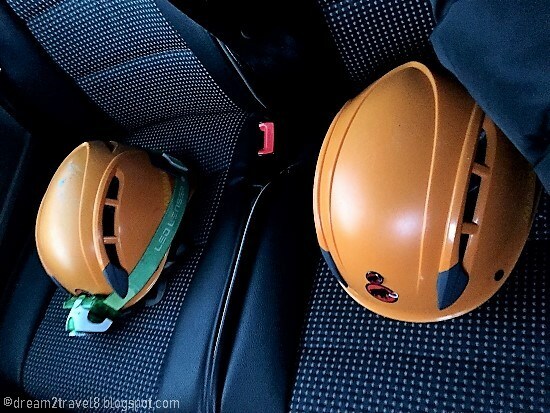 As we drove off from the pit stop, our guide mentioned that we had covered all the places planned for today and in view that there was still some time left before the sun sets, he had made arrangements with our driver to head to another additional surprise site. Upon hearing this great news, all of us started clapping and cheering for our guide and we were once again filled with anticipation for what is in store at this next location. 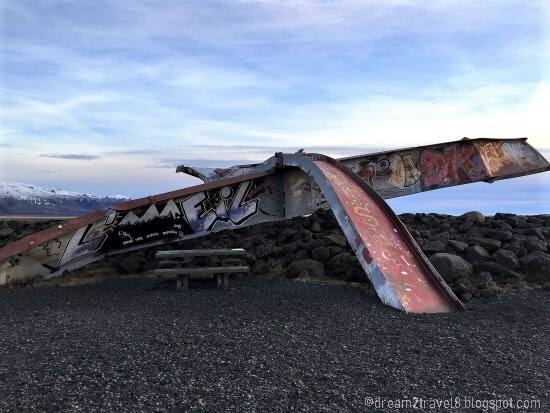 Along the way, our driver decided to make a short stop at the Skeiðará Bridge Monument and our guide started to explain to us about this monument when we had all gathered around it. 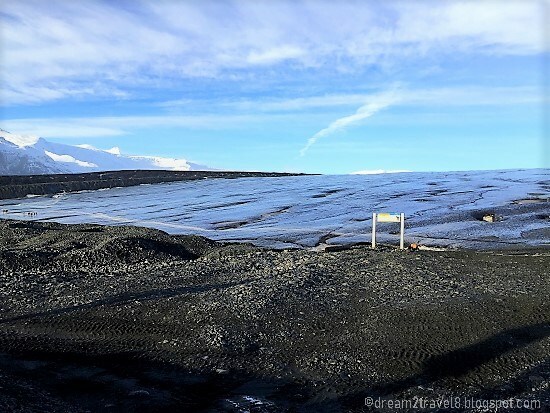 The monument, made up of remnants of the Skeiðará Bridge, was once part of the Icelandic Ring Road and allowed people to drive across the Skeiðarár Sandur (a wide plain of black volcanic sand marbled with creeks of run-off from the Skeiðarárjökull glacier). 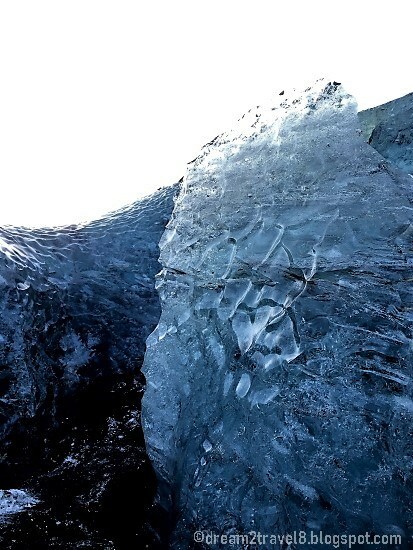 However, in 1996, the eruption of volcano Vatnajökull melted a portion of the glacier which resulted in massive floods. The flood water, carrying with it the huge chunks of icebergs, crashed into the bridge and destroyed it, creating a gap in the main ring road around Iceland. This monument has from then on, served as a reminder of the powerful forces of Nature. 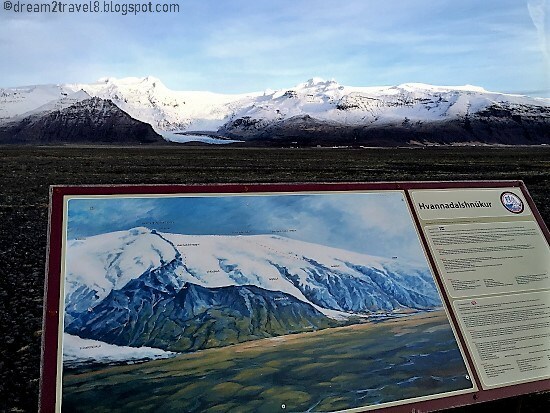 Although this site had quite a grim history, it was surprisingly also a nice spot to view the öræfajökull glacier and the accompanying Mount Hvannadalshnúkur (highest mountain in Iceland). We were left to ponder over the destructive forces of Mother Nature seen in Iceland while travelling to the last destination of the day. Our guide refused to let us know where we would be heading to and only reveal the location of this mysterious place when we were approaching it. 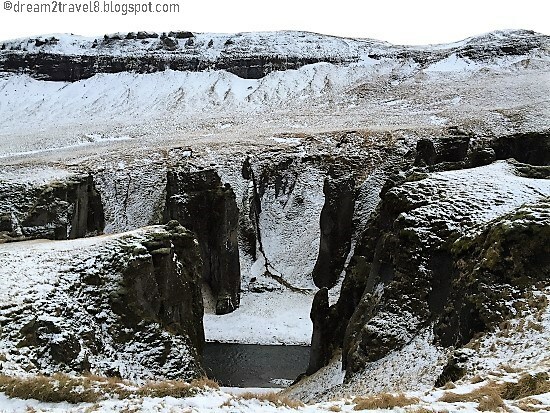 We were visiting Fjaðrárgljúfur, a massive canyon that is about 100 meters deep and about 2 kilometers long! At the time of our visit, the whole place was still covered in snow. It was quite a hike to get to the top to have a better view of its depth. 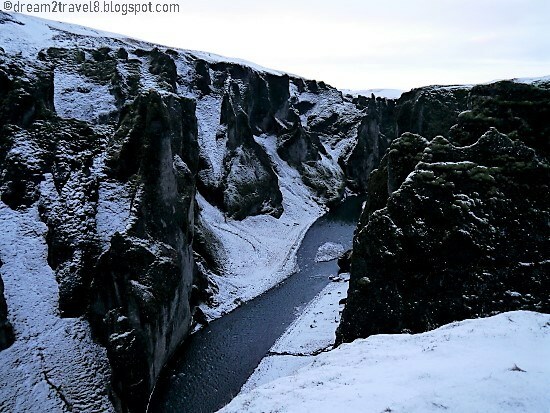 With the sun setting in the background, snow covering most of the cliffs and surrounding land as well as the stillness of river Fjaðrá located in the depths of the canyon, it felt like time had come to a stand-still in this place! 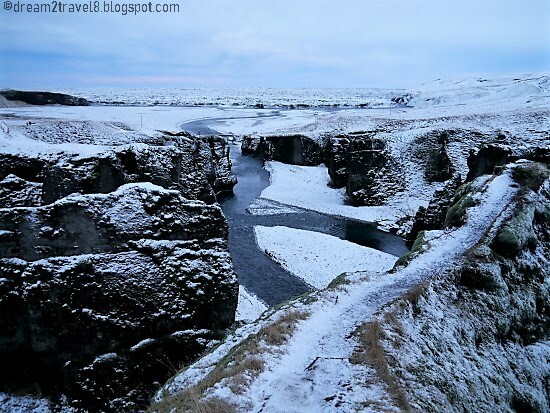 Again, as with the previous few other sites that we had visited, Fjaðrárgljúfur is yet another place whose beauty is beyond description! All in all, although this day had been an emotional roller coaster ride (with all the excitement and joy of visiting many awe-inspiring and out of this world landscapes of Iceland, the disappointment at not being able to visit an actual ice cave and the grim moment of realization of the effects of the destructive forces of Nature), my husband and I were still glad that we chose to go on this tour and we certainly look forward to more exciting adventures planned for the next day!